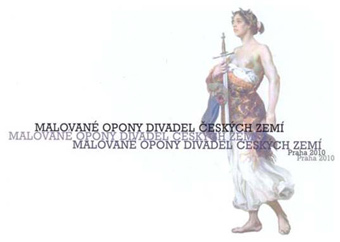 Invitation: Concert "Brikcius in Řetězová I." & "Prague - Brno: 6 Contemporary Composers for Cello Solo in the Interpretation of František Brikcius"
You are invited to the concert "Brikcius in Řetězová I." & "Prague - Brno: 6 Contemporary Composers for Cello solo in the interpretation of František Brikcius" of the Czech Cellist František Brikcius, held on Saturday 23rd July 2011, 7pm, at the Gallery Art Space Řetízek (Řetězová 7, Praha 1, downstairs). Tickets at the doors, thanks to limited capacity of the concert hall, we recommend early bookings. 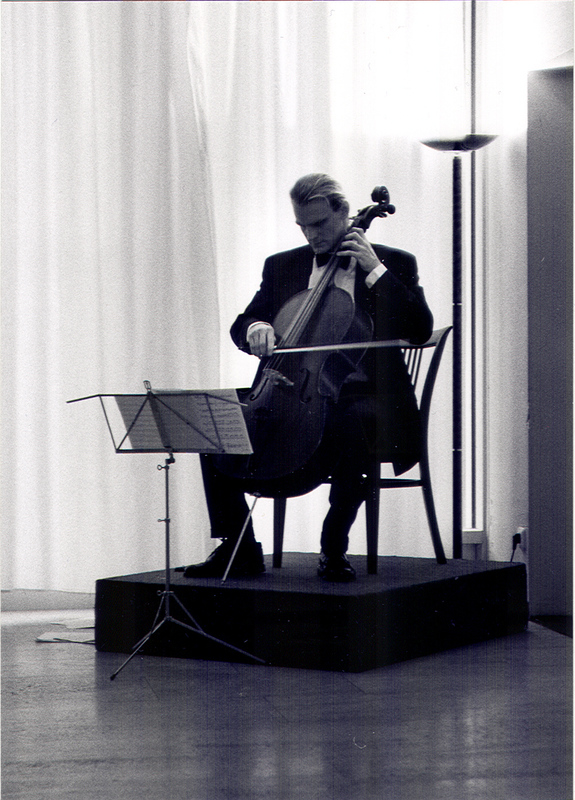 František Brikcius will be playing works of Czech composers from Prague and Brno, featuring Sonata (1987) by Luboš Fišer and Stopy (2005, Festival Violoncello 2005 in Brussels) by Czech composer and organist Irena Kosíková. You will hear music by Jiří Matys, Petr Hejný, Jan Jirásek, Luboš Fišer, Miloš Štědroň and Irena Kosíková. Project was held under the auspices of Václav Havel. Concerts "Prague - Brno: 6 Contemporary Composers for Cello solo in the interpretation of František Brikcius" and "Tartini's L'Arte dell'Arco in the Interpretation of František Brikcius" have been presented, as part of the "Brikcius Cello Tour 2007", in Austria, Belgium, Bulgaria, the Czech Republic, France, Italy, Russia and the United Kingdom. In the cooperation with the Art Space Řetízek. More details on websites http://www.Brikcius.com , http://www.Retezova7.cz and http://www.iKosik.com . Saturday 23rd July 2011, 7pm, Gallery Art Space Řetízek (Řetězová 7, Praha 1, downstairs). What place is held concert of the Czech cellist "Brikcius in Řetězová I."? Contest is over, lucky winners are E. H. from Prague and J. P. from Bratislava. Internet magazine Místní kultura is bringing together cultural mosaic of the Czech republic since 1991. Visit websites www.MistniKultura.cz . 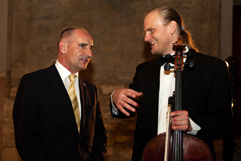 Místní kultura is media partner of projects "eSACHERe", "Brikciusová Na Prádle" and "Duo Brikcius - 2 Cellos Tour II.". 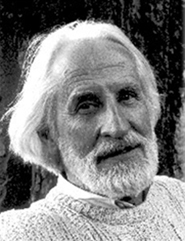 Swiss composer Klaus Huber was born in Bern on 30th November 1924. He attended a grammar school in Basel and completed a teacher training course in Küsnacht/Zürich. He studied violin with Stefi Geyer (1947-1949) and theory and composition with his godfather Willy Burkhard (1947-1955) at the Conservatory in Zürich where he also taught violin from 1950-1960. Huber continued his studies at the Staatliche Hochschule für Musik in Berlin with Boris Blacher (1955-1956). In 1955 his work was performed at the International Gaudeamus music week in Bilthoven in the Netherlands. Later in 1959 he was awarded the first prize for chamber music in the composition competition of the Italian ISCM section during the World Music Days of the IGNM in Rome. Huber took up a teaching post in musical history at the Conservatory in Lucerne (1960-1963). His composition appeared at the Internationale Ferienkurse für Neue Musik, Darmstadt. In 1961-1972 he taught at the Academy of Music in Basel, where from 1964, he was the director of the composition and instrumentation classes and from 1968 director of the master-class in composition. Huber was a member of the international jury of the ISCM World Music Days (1965, 1969, 1987) and director of the analysis courses and seminars at the international composition competitions of the Gaudeamus foundation in Bilthoven in the Netherlands (1966, 1968, 1972). In spring 1968, the Soviet Composers Association, invited him to the Soviet Union (Moscow, Leningrad, Kiev). In 1969 Huber founded the International Composers' Seminar in the Künstlerhaus Boswil in Switzerland. In 1973 he won a scholarship from the Deutscher Akademischer Austauschdienst (DAAD) in Berlin. Huber became successor to Wolfgang Fortner at the Staatliche Hochschule für Musik in Freiburg as director of the composer class and of the Institute for contemporary music. From 1979 to 1982 he is president of the Swiss Composers' Association. In 1983 Huber travelled for the first time to Nicaragua where he met with Ernesto Cardenal and gave lectures in La Habana in Cuba. One year later he gave lectures on "Cursos latinoamericanos por la musica contemporanea" in Tatui in Brasilia. He made a second journey to Nicaragua where he lectured at the Escuela Nacional de Musica in Managua. He was a guest professor at the McGill University in Montreal in Canada and guest professor at the Accademia Chigiana in Siena. In 1986 he gave lectures at the universities of Tokyo, Nagoya and Hiroshima in Japan. He was a guest professor at the IRCAM, Paris (1986, 1988, 1990, 1993) and at the Conservatoire National Supérieur de Musique, Paris (1987, 1989, 1992). Huber taught at the Summer seminar for young composers at Radziejowice in Poland (1987) and gave composition seminars and lectures at the conservatories in Malmö and Stockholm (1989). In 1990 Huber resigned from teaching at the Staatliche Hochschule für Musik in Freiburg and continued giving masterclasses at Luzern/Boswil (1994), the composition seminar at Schloss Schielleiten in Graz (1994) and masterclasses at the Hochschule für Künste in Bremen (1997). He was guest professor at the Sibelius Academy in Helsinki (1990), at the Royal Academy of Music in London (1991), at the Conservatoire de Musique in Genève (1991), at the Brandenburgisches Kolloquium Neue Musik in Berlin (1991), at the Scuola Civica di Musica in Milano (1992-1993), at Winterthur, Viitasari and the Akiyoshidai Festival in Japan (1995), at the Lyon Conservatoire (1996), Aristoxenos-Masterclass in Aigion in Greece (1996), at the Sarajevo Conservatoire (1997), at the Grieg Academy in Bergen (1998) and at the University of Alcalà in Spain (1998). Huber was composer in residence at the Academy of Music in Basel (1992), at the festival "Musica" in Strasbourg (1992), at the Huddersfield Festival (1992), at the Centre Acanthes, Villeneuve lez Avignon (1993), at the New Music Concerts in Toronto (1993), at the Internationale Musikfestwochen in Luzern (1994); at Winterthur, Viitasari and the Akiyoshidai Festival in Japan (1995), in Caracas (1997) and at the Bergen Festival (1998). In 1998 he founded the concert series "Musica insieme Panicale" in Umbria. Recently his work was performed at the Lucerne Festival, the Festival Musica in Strasbourg and the Warsaw Autumn Festival. Huber is a socially and politically conscious composer and his music often conveys a humanistic message. Since 1975 his works have been published by Ricordi Editions in Munich. The autographs are available in the Paul Sacher Foundation in Basel. He is author of various writings, such as "Umgepflügte Zeit" (Cologne, 1999), "Unterbrochene Zeichen - Klaus Huber" (Saarbrücken, 2005) and "Klaus Huber: Von Zeit zu Zeit, Das Gesamtschaffen" (2009). Klaus Huber is member of the "Bayerische Akademie der Schönen Künste", of the "Akademie der Künste Berlin" and of the "Freie Akademie der Künste Mannheim", honorary member of the ISCM as well as honorary doctor of the University of Strasbourg. His awards and prizes include Beethovenpreis of the city of Bonn (1970), Prize of the Swiss Composers (1975), Artprize of the city of Basel (1978), Reinhold-Schneider-Prize of the city of Freiburg (1985), Premio Italia (1986), the European Church Music Prize by the city of Schwäbisch Gmünd (2009), Music Prize Salzburg (2009) and Ernst von Siemens-Musikpreis (2009). He lived in Bremen and Panicale in Perugia in Italy. He died on 2nd October 2017 in Perugia. Together with another 11 composers - friends (C. Beck, L. Berio, P. Boulez, B. Britten, H. Dutilleux, W. Fortner, A. Ginastera, C. Halffter, H. W. Henze, H. Holliger and W. Lutoslawski) of Swiss composer and maecenas Paul Sacher (1906 - 1999), he was asked by Russian cellist Mstislav Rostropovich on the occasion of Sacher's 70th birthday to write composition for cello solo with use of notes creating his name (eS, A, C, H, E, Re). Klaus Huber created Transpositio ad infinitum. Compositions were partially presented in Zurich on 2nd May 1976. 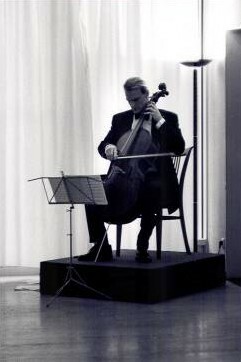 Whole "eSACHERe" project was (for the first time in complete performance) performed by Czech Cellist František Brikcius in 2011 in Prague. For more about Klaus Huber visit http://www.Brikcius.com , http://www.KlausHuber.com and http://En.Wikipedia.org/Wiki/Klaus_Huber . Call for ... read new interview about project "eSACHERe"